Duke University School of Law (also known as Duke Law School or Duke Law) is the law school and a constituent academic unit of Duke University, Durham, North Carolina, United States. One of Duke's 10 schools and colleges, the School of Law began as the Trinity College School of Law in 1868. 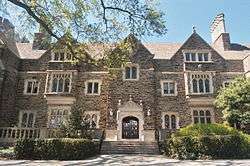 In 1924, following the renaming of Trinity College to Duke University, the school was renamed the Duke University School of Law. Notable alumni include former President of the United States Richard Nixon, esteemed television personality Charlie Rose, and United States Solicitor General Kenneth Starr. On average, 95% of students are employed at graduation, with a median starting salary in the private sector of over $160,000. Duke Law is consistently ranked as one of the top law schools in the United States, with an acceptance rate of roughly 20%. According to U.S. News Report, Duke Law is ranked the #11 law school in the United States. Duke Law is routinely ranked within the top 14 law schools in the country, and is a member of the "T-14" law schools, a prestigious group of 14 schools that have national recognition. Duke Law along with only two other T-14 schools (Harvard and Yale) has graduated a President of the United States. In 2011, law firm recruiters ranked Duke Law as the 8th best law school in the country. In addition, Duke Law was ranked by Forbes as having graduated lawyers with the 2nd highest median mid-career salary amount. In the Above The Law Rankings, Duke Law ranks within the top ten law schools at #6 based on long-term employment data, large firm placement, and federal clerkship placements. It currently is ranked the #8 best law school by the 2015 U.S. News Rankings  and has remained in the T-14 since U.S. News began ranking law schools. In fact, it has never been ranked lower than 12th by U.S. News. The law school is also well known for the strength of its alumni network. The law school's career services office regularly keeps in contact with Duke Law alumni, fostering concrete relationships between students, alums, and faculty. Duke Law is one of the most selective law schools in the United States. The law school is one of few that have experienced an increase in law school applications despite an overall national decline of applications in recent years. For the class entering in the fall of 2014, 221 students enrolled out of 5,358 applicants. The 25th and 75th LSAT percentiles for the 2014 entering class were 166 and 170, respectively, with a median of 169 (top 3% of test takers worldwide). The 25th and 75th undergraduate GPA percentiles were 3.66 and 3.85, respectively, with a median of 3.77. The School has approximately 640 J.D. students and 75 students in the LL.M. and S.J.D. programs. In 1855 Trinity College, the precursor to Duke University, began offering lectures on Constitutional and International Law (during this time, Trinity was located in Randolph County, North Carolina). In 1865, Trinity's Law Department was officially founded, while 1868 marked the official chartering of the School of Law. After a ten-year hiatus from 1894 to 1904, James B. Duke and Benjamin Newton Duke provided the endowment to reopen the school, with Samuel Fox Mordecai as its senior professor (by this time, Trinity College had relocated to Durham, North Carolina). When Trinity College became part of the newly created Duke University upon the establishment of the Duke Endowment in 1924, the School of Law continued as the Duke University School of Law. 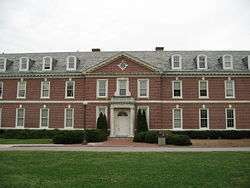 In 1930, the Law School moved from the Carr Building on Duke's East Campus to a new location on the main quad of West Campus. During the three years preceding this move, the size of the law library tripled. 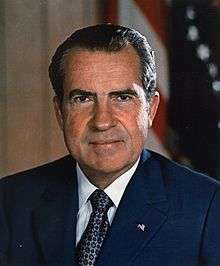 Among other well-known alumni, President Richard Nixon graduated from the school in 1937. In 1963, the school moved to its present location on Science Drive in West Campus. 3rd Best Law School (overall) according to the Best Law Schools ranking published by the National Jurist in 2013. The Trinity College School of Law was located in the Carr Building prior to the renaming of Trinity to Duke University in 1924. The Duke University Law School was originally housed in what is now the Languages Building, built in 1929 on Duke's West Campus quad. The Law School is presently located at the corner of Science Drive and Towerview Road and was constructed in the mid-1960s. The first addition to the Law School was completed in 1994, and a dark polished granite façade was added to the rear exterior of the building, enclosing the interior courtyard. In 2004, Duke Law School broke ground on a building construction project officially completed in fall 2008. The renovation and addition offers larger and more technologically advanced classrooms, expanded community areas and eating facilities, known as the Star Commons, improved library facilities, and more study options for students. Law and Contemporary Problems is Duke Law's oldest law journal, though it was originally faculty-edited until the 1970s. The Duke Law Journal was the first student-edited publication at Duke Law and publishes articles from leading scholars on topics of general legal interest. Duke publishes the Alaska Law Review in a special agreement with the Alaska Bar Association, as the state of Alaska has no law school. The Duke Journal of Gender Law & Policy (DJGLP) is the preeminent journal for its subject matter in the world. The Duke Journal of Constitutional Law & Public Policy was founded by members of the Class of 2006—the six members of the inaugural executive board were Sarah Coble, Chris Fulmer, Richard Goldberg, John Lomas, Scott Mikkelsen, and John Plecnik. Professors Erwin Chemerinsky and Christopher H. Schroeder served as the ConLaw journal's inaugural faculty advisors. The Duke Forum for Law & Social Change was founded in 2008 and features articles covering a wide range of social issues, from immigration law and policy to poverty initiatives. The Law School provides free online access to all of its academic journals, including the complete text of each journal issue dating back to January 1996 in a fully searchable HTML format and in Adobe Acrobat format (PDF). New issues are posted on the web simultaneously with print publication. In 2005, the Law School was featured in the June 6 unveiling of the Open Access Law Program, an initiative of Creative Commons, for its work in pioneering open access to legal scholarship. The School offers joint-degree programs with the Duke University Graduate School, the Duke Divinity School, Fuqua School of Business, the Medical School, the Nicholas School of the Environment and Earth Sciences, the Pratt School of Engineering, and the Sanford School of Public Policy; and a JD/LLM dual degree program in International and Comparative Law. Approximately 25% of students are enrolled in joint-degree programs. According to Duke's 2013 ABA-required disclosures, 85.9% of the Class of 2013 obtained full-time, long-term, JD-required employment nine months after graduation. Duke's Law School Transparency under-employment score is 4.7%, indicating the percentage of the Class of 2013 unemployed, pursuing an additional degree, or working in a non-professional, short-term, or part-time job nine months after graduation. 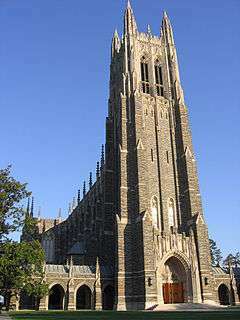 The total cost of attendance (indicating the cost of tuition, fees, and living expenses) at Duke for the 2015–2016 academic year is $80,937. The Law School Transparency estimated debt-financed cost of attendance for three years is $285,725. Allyson Kay Duncan, '75 – U.S. Court of Appeals Judge, U.S. Court of Appeals for the Fourth Circuit. Ivan C. Rutledge - Dean, Ohio State University Moritz College of Law. Notable faculty including a sitting Supreme Court Justice, a former United States Senator, 14 former Supreme Court clerks, a former federal judge and a former Judge Advocate General. 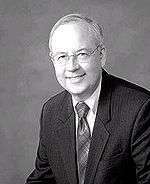 David F. Levi, Dean, former Chief Judge of the United States District Court for the Eastern District of California (1994–2007), Fmr. Law Clerk to Supreme Court Justice Lewis Powell, Son of Fmr. U.S. Attorney General Edward H. Levi. ↑ , Timeline of Duke Law. Accessed November 12, 2007. ↑ "Duke Law School | Law School Numbers". duke.lawschoolnumbers.com. Retrieved 2016-04-19. ↑ James Andrew Courter, Biographical Directory of the United States Congress. Accessed September 6, 2007.